Data Governance (DG) is the overall management of the availability, usability, integrity and security of data used in an organisation. A sound data governance program ensures that data is consistent and trustworthy. Concretely, DG in the Human Brain Project includes multiple groups with responsibility for developing, approving, organising and implementing policies, procedures and standards for the most effective use of the Human Brain Project’s structured and unstructured data. Essentially, data governance is a strategy. It is a set of formal processes that ensures data is properly managed: how information is generated, stored, used, maintained, etc. In a legal context, data governance includes control and oversight over related policies, standards, and procedures, with effective oversight managed by a regulatory group. In other words, it combines strategies and information, focusing on privacy, quality and integrity of the data and supporting the HBP in meeting regulatory requirements. Ultimately, it ensures that data serve the purposes of the Human Brain Project in an ethical and legal way so that it can maximize the potential of the data. The Human Brain Project deals with different types of data from different provenances, for different uses, by different people, in different contexts and countries, with different objectives and different means. In a single sentence, one can understand how crucial Data Governance is within the HBP. The DGWG includes an assembly of DG representatives from each Subproject, representing all facets of the activities across the project. 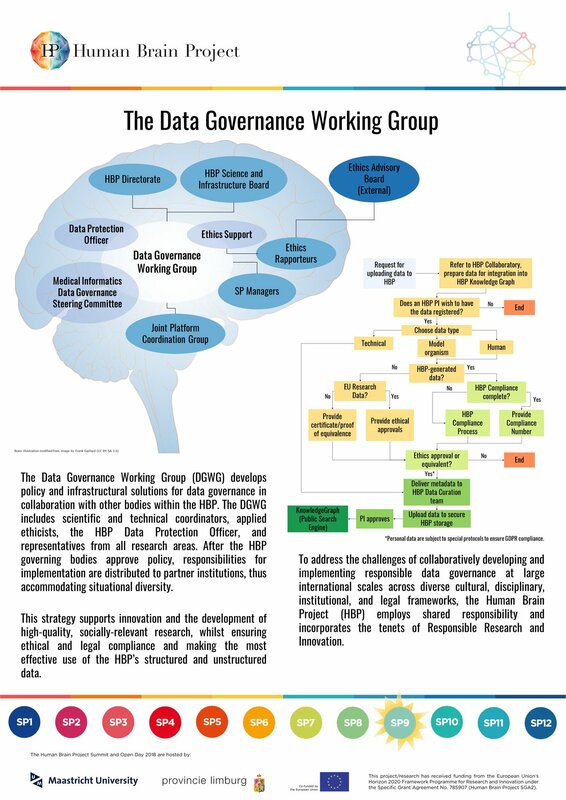 This group supports the advancement of research in the Human Brain Project by developing responsible data governance and data sharing practices for approval, adoption, and implementation by the decision-making bodies in the project. The DGWG works closely with other bodies in the HBP, notably the Science and Infrastructure Board, the Directorate, the Data Protection Officer, the Scientific and Technical coordinators, the Medical Informatics Data Governance Steering Committee, and other relevant bodies such as the Ethics Support team, and the independent Ethics Advisory Board. Our Terms of Reference can be found here .